I participate in a number of on-line surveys. I earn points, AirMiles, and just kill time believing I am influencing the world!!!! So, in this context, take everything a survey says as “Crap on a Stick“! Surveys are mostly done by people, like me, raging lunatics, so…don’t believe a word of what they say. We’re messing with you. But…(why I started this blog entry) I got a survey that asked me my favourite sports celebrity. A) I don’t watch much sports. B) I love my husband and do NOT fantasize about sports celebrities. C) Not one woman was listed! It pisses me off. Who are my favourite cartoon characters? Who is my favourite sports celebrity? Who is my favourite movie star alive and dead? My current favourite sports celebrity is Diana Matheson. My favourite movie star, dead: Katherine Hepburn and living: Judi Dench. I am not striving to look like them but I sure would like their talent and integrity. Oh, yes and their amazing sense of humour!!!! Cartoons are a whole different ballgame. I had two girls and I would only let them watch certain cartoons. Of course, they were ones that promoted equality for women not victimization. I was for the use of your brain and personal skills versus weapons (not GI Joe). I did like Teenage Mutant Ninja Turtles but really – they were turtles led by a rat!!!!! I miss you Michelangelo. Anyways, when my girls were little they came home and watched Sailor Moon. I love anime so I approved this. (I also approved He-Man but for a different reason – Beastmaster, the movie and the tiger.) But I still believe that Sailor Moon was a good cartoon for girls. She was human; ditzy; had a cat named, Luna, who talked; was easily led by romance and could beat anything by whirling and changing into different clothes. She also had a wonderful group of friends who had powers, too. If I could have been one of the gang I would want to be Sailor Jupiter. Yes, a grown woman with cartoon fantasies. Yes, a tall brunette who is very strong, a little uncontrollable and could blast things in her green and pink sailor suit. Sigh. 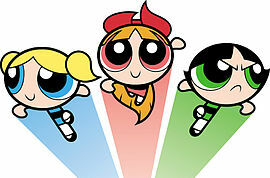 As the girls got a little older the PowerPuff Girls arrived. Looking back I don’t even remember them watching them that much. I think I did while they were outside playing. I also think that is a good reason I’m the size I am and they are still in pretty good shape. I didn’t much like the animation style of Power Puff Girls it was very 2-dimensional and compared to Japanese animation – oh wait – there is no comparison. But the three main characters are a hoot. They are little girls with special powers and each has a very distinct personality and even though I have now become blond (like Bubbles) I really identify more with Buttercup. Oh look! 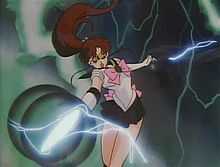 She resembles Sailor Jupiter – dark hair, green dress and angry. So, why can’t women be sports celebrities? Why can’t Judi Dench be the movie star I admire most? The answer – they can and they are. I may be on the far side of true mid-life. (I will not be living to a 100.) But I can still fantasize about being a powerful girl with super powers. I might even age her a little gracefully and make her in charge of her future in every way. (Eat your heart out Mr. Gray!) I will continue to watch anime and I WILL take my Gargoyle lunch kit to work filled with low-calorie, good for me, food. Sigh – Goliath. ~ by 1fatgirlshrinking - Diane Kirby on August 12, 2012.